Keep your dates open! 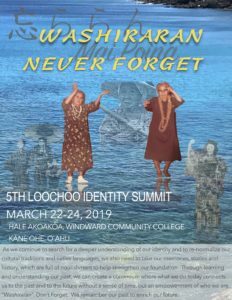 March 22-24 2019 is the next LooChoo Identity Summit. We will be returning to the University of Hawaiʻi Windward Campus, Hale Ākoakoa. The theme for this summit is “Washiraran, Mai Poina”, “Never Forget”, as we look at the importance to look at the past as we go into the future. Stories and events from our past, especially from the experiences of our issei, first generation immigrants, are being lost and it is important to remember and pass them on to appreciate what we have now and passion into the future. We will be posting the details soon for pre-registration. Please make sure to mark your calendars . Special guests this year will be from the Yaeyama Islands to share their music and dances, as well as how it passes down their stories from their islands and history. Spaces are limited. If you would like to already reserve a space, please email ukwanshinevents@gmail.com and we will send you the details soon. Please excuse our website and blog as we are reworking our website after very busy schedules, and will be updating pages and postings. We will continue to post events and announcements on our blog as we work on our website. Stay connected for more on culture, language, entertainment and news. Last May Ukwanshin Kabudan visited the Los Angeles Okinawa community for a workshop and performance focusing on connecting back to cultural roots and history. Although we were all the way in Southern California, it felt like home with the warm hospitality of the community and great home cooked food. The Los Angeles Okinawa community is blessed to have great facilities which service the people with workshops, social and cultural gatherings, and classes for music, dance, food, etc., as well as hosting visiting guests. They are also very lucky to have 2 energetic young bodies working at the organizations office. Both Joey and Yuka bring such great power to keep their busy schedule going. Than you to all for such a great time. It was great to have a standing room only event. Looking forward to visiting again. Okinawan family enjoying Shiimi at their family tomb. The season of Shiimi begins on April 5th this year. 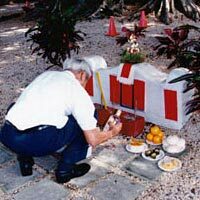 Usually lasting from a week or two, families gather at gravesites or tombs to pay respects to the ancestors by offering food, incense, and burning paper money. 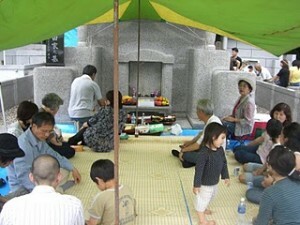 For many in Okinawa, it takes up almost the whole day, and looks like a family picnic at the family’s tomb. Man also play sanshin and dance. Its like a small party with the departed relatives, and is observed around the beginning of spring. This practice of Shiimi comes from the Chinese ChingMing, and is observed on the dame time according to the lunar calendar. 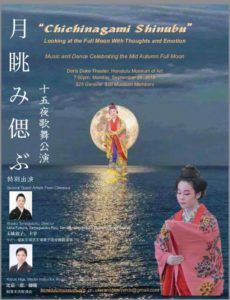 As many cultural practices that reflect the Chinese influence on Okinawa, Shiimi still one of the main observances that date back centuries, and still widely practiced today. Family members go early to clean and prepare the gravesite. Many have become elaborate, with tents, mats, tables for food, and even catered traditional foods. Here in Hawai`i, we don’t see Shiimi practiced too much in our Okinawan community, partially due to the issei not passing this tradition down. many of the Okinawan traditions and language was lost or not practiced due to the prejudice the Okinawan immigrants faced after arriving in Hawai`i. They tried hard to assimilate in the already bad conditions of the plantations. 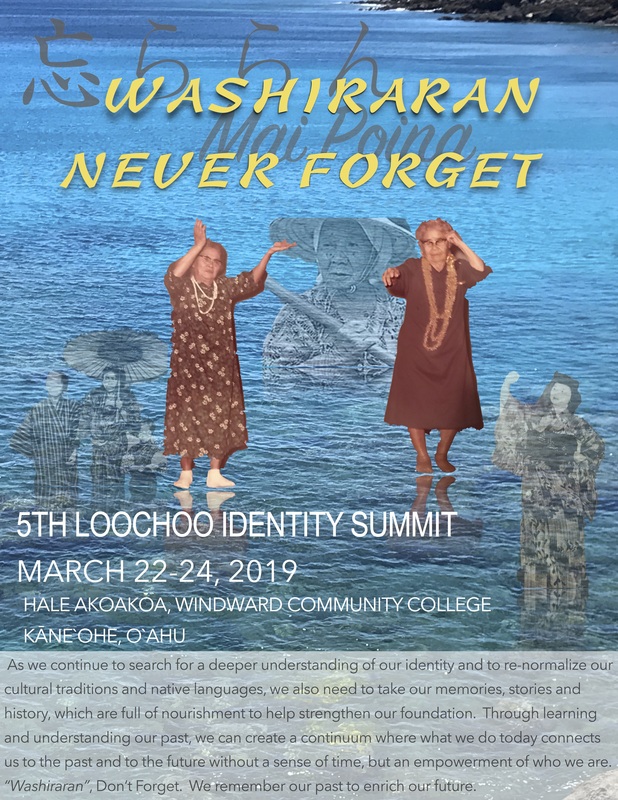 Hopefully, we can revive and pass on this practice in Hawai`i, as a way to instill respect and honor those who set the foundation of where we are today. It was an eventful day, beginning with stress, worry and unsettling anticipation as all hawai`i awaited the arrival of the predicted Tsunami which was created from the 9.0 earthquake in Chile. Almost everyone in Hawai`i was alerted and shaken from sleep at 6am, with sirens that was the first real alert of the pending danger to come. Luckily, the Tsunami turned out to be only a few feet with non significant strength to do damage across the island chain. 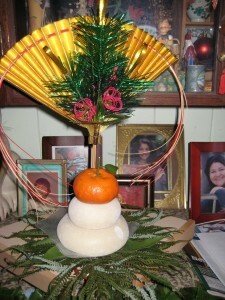 With that out of the way, Kohala Okinawans went forth with their annual New Years gathering at the Hawi Jodo Shu Hall. The only set back and missing attendance was the Hilo group who had to cancel. However, Young Okinawans of Hawai`i members from Honolulu, Aaron Hoo and Lawson Kita brought smiles and excitement with the Shisa Mo-i. This was a rare treat for the Kohala members. Ukwanshin leaders, Norman Kaneshiro and Eric Wada provided music and jikata for the local dancers, Lois and Tah Ajimine. “We were so overwhelmed and thankful” said Mrs. Nakamura(91) of Kohala. 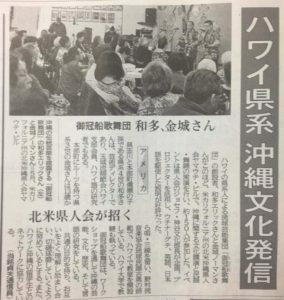 “Its been almost 20 years since we really had live Traditional Okinawan music.” Many older members commented that they were happy to see live Okinawan entertainment that they had not been able to experience since their issei were there. The songs and dances brought back nostalgic memories and many talked to about the plantation days and started to remember the “old days” “I never thought I would hear those songs again” said one older member. Could This Be the Future of Okinawans? (Feb. 5) – Marking the end of a language and an entire people, the last member of the Bo, an ancient tribe that lived in the Andaman Islands, has died. When Boa Sr, as she was known, died last week, she was believed to be about 85 years old. Her husband had died years beforehand, and Boa, whose name means “land” or “earth” in the Bo language, had no children. When Boa Sr, the last member of the Bo tribe of the Andaman Islands, died last week, the Bo language died along with her. In 1858, when the British decided to colonize the Andaman Islands and use them as a penal colony, they estimated that 5,000 Great Andamanese lived there. “At first, the British didn’t notice any difference between the tribes,” said Sophie Grig, senior campaigner at Survival International. But in 1879, a British officer named M.V. Portman was appointed officer in charge of the Andamanese, and after years of attempting to acclimate them to life as British subjects, Portman wrote “A Manual of the Andamanese Languages,” which distinguished the differences among tribal languages. In many parts of the islands the natives were still either ferocious enemies or at best half-tamed; and his work consisted in making contact with them and very gradually bringing them to recognize the value of British rule. But colonization proved ruinous for the tribes of the Andamans, including the Bo, with large numbers decimated by measles and syphilis brought to the islands by foreigners. Many of those who were left gravitated to alcohol, another import to the islands, as a way of seeking solace. In 1970 the Indian government began relocating the Bo to a settlement of concrete row houses on Strait Island. Boa Sr was moved in 1978, and Abbi said she often said that she missed her old life in the jungle. “A language contains the memories and experiences, everything that explains and encapsulates a way of life,” Grig said. Haisai Gusuyoo! Happy New Year and may you have a healthy and prosperous 2010! Although we don’t actually welcome in the year of the Tiger till February 14th, many of us have , or are celebrating the start of a new decade. What will it have in store for us? Looking back at this past year for Ukwanshin, there has been so much to be thankful for and so many blessings on our work and the many people who have gotten involved with project Ukwanshin. It seems that there is a hunger for the culture and identity, and also for the reconnection to the ancestors who came before us and practiced our culture. Hope fully this will continue and grow stronger through this year. One observation I did see though, that is a sign of the times in many families is the loss of families spending time, especially in the new year and also young ones staying with close family and friends to help make food and enjoy together. The sharing of food was very essential before to share whawts going on with each other, learn cooking and also to just spend time together. I’ve heard many Okinawans say that they don’t make the food that their grandparents or great grandparents did, because they don’t know how, or that the families don’t get together…or worse…”it’s too humbug”. Home made food..especially for this kind of time, is actually nourishment for our bodies, and also…for our soul. Okinawans beleive that something made by others has the spirit of that person, and is actually a gift that we take into ourselves when we eat. It ties into the belief of the weavers who made the cloth for their loved ones and beleived that the cloth was a sort of protection. I can see how valuable it was in the many songs that talk about food and how the elders made it for the children. References to the different foods and nostagia in being able to eat something that grandma made is very prevolent in many folk songs. This should not end there, but should live in our families and homes. We look forward to being able to continue our workshops and programs, and wish you a safe and happy new year! Such simple words form the classical song “Yanaji”, but as many “ufu bushi”, classical music pieces, this Ryukyu poem expresses deep meaning that is so simple to understand if we look at the symbols it envokes. In these words, we can basically find so many answers to our problems and misunderstandings. Our ancestors understood this and have passed this down to us through the songs and dances, but due to the modern and technical interference, our sublime senses have been shut down and our human pride has taken over. If we look around, nature responds to its natural cycle everyday. Even the smallest blade of grass, with the morning dew shining with the reflection of the sun, shows joy in the return of the morning and gives thanks to another day. We are not machines, but a being of nature that has a connection to our ancestors. I compare it to the 200 year old “matsu” or pine tree that stands strong on the cliff and grows greener every year as it endures winds, rain , heat and cold. It drops its seeds to create new generations which in turn become other pine that have the same identity of its parent. Its only when the identity through tampering from the outside is introduced , that the identity changes and sometimes leads to the demise. Each part of nature has its own identity and treasure to contribute to the world. If we can understand to keep connected and always refer to our roots, we may find it easier to cope, although we may find it hard at times since this is not the act of the majority. However, this is our contribution, and our natural obligation. “Wakamatsi ya miduri, kugani hana sachuru, tani kara nmariti, yugafu churasa” The young pine is so green, the beautiful flower(child) blooms, from the seed we are born, how beautiful it makes the world. Happy Holidays! We have 2 offers for those of you who would like to get something for your donation to Ukwanshin. 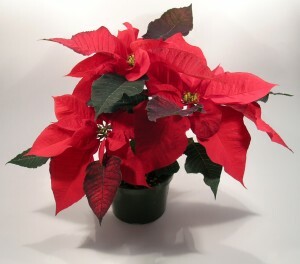 The first is Poinsettia plants that will be available December 5&6th at Kamemoto Nursery in Manoa, or we can deliver too. Each plant is in a 6-8″ pot and stands about 2ft tall with multiple blooms. Decorate your house or give to someone for a $10 donation. The second is a preset dinner for a donation of $50. This is the same as we had before. Prepared by Chef Russel Siu of 3660 on the Rise, you’l start with a salad, choice of selected entre, and dessert duet. Tax, tip and soft drink included. Let us know if you want to take advantage of these holiday offers. The 3660 Dinners will be available from January through March, but tickets will be on sale till end of December. Welcome to the Ukwanshin Kabudan homepage. We hope you will find our site as interesting as it is entertaining. 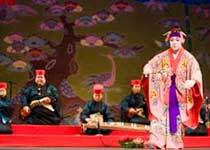 We are here to share information on our performances, as well as provide you with insights into the rich performing arts heritage of Okinawa. 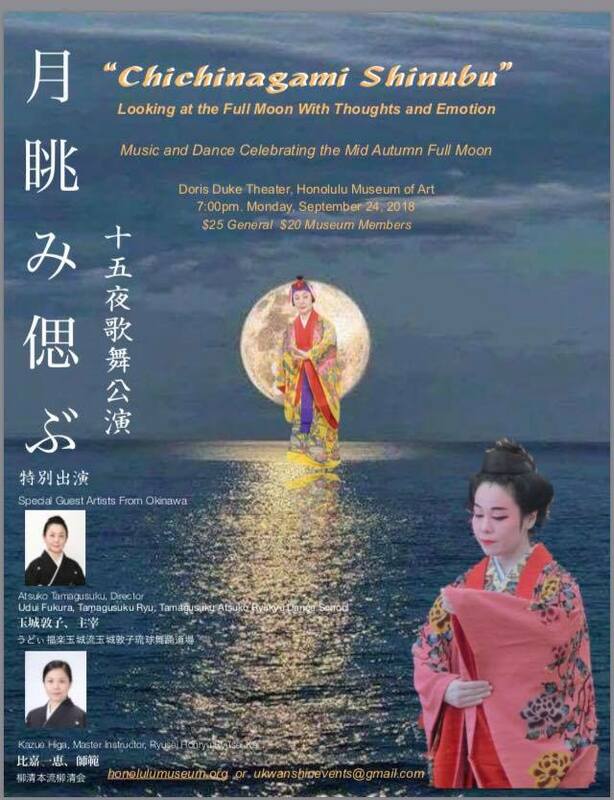 Our mission is to foster goodwill and peace through sharing the music and dances of Ryukyu/Okinawa. Because of the current influences of Japan and the world in Okinawa, there is much change happening within the music and dance world. The focus is no longer on the preservation of traditions, and it is this that the Ukwanshin Kabudan looks to preserve. There is continuing research and study of protocol and customs, which are passed down through the members. 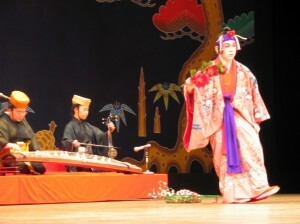 The troupe has also performed in Okinawa to a sellout crowd, as well as within Hawai'i and most recently, Seattle, Washington.